thats a really nice illustration. GWs main design problem is making the normal humans too tall, how come Catachans look bigger than SpaceMarines? Big design error... Secondly the vehicles are too small, the new Dystopian Wars 28mm game shows you can have realistic sized vehicles on a 28mm table, and they look great. Thanks! I agree about the humans being too small. I don't really understand why people make true scale space marines, because that makes all the vehicles look much more out of scale. Having said that, I really don't mind the fact that they scaled the models the way they did. And actually, now that I'm looking at the actual models, the scale really isn't that far off for the marines. The biggest problem is, as you said, the guardsman model is too big. 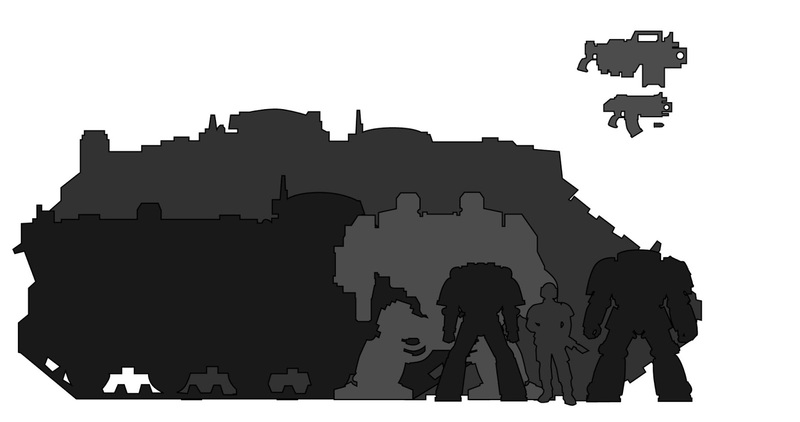 Maybe the scale of the Land Raider is still too small in my diagram. We're getting the word out to some local bloggers, and would like to send you a free bookoo t-shirt (no strings attached!). If you would like a free t-shirt, will you send me an email at kellin@bookoo.com with your address and shirt size? I'll get it out to you right away. Did you know you can create short urls with AdFly and make money from every click on your short links.